Parkhead Railway Station served the East-end of Glasgow for much of the last century. Opening in the early 1900's it was renamed Parkhead Stadium in 1952 because of its close proximity to Celtic's ground. 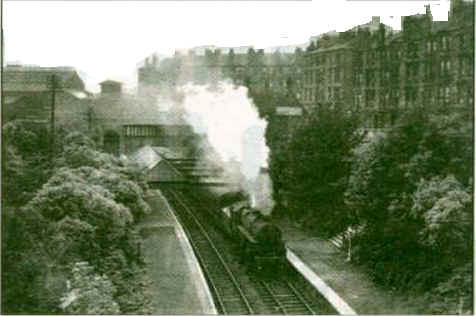 The station was situated in a cutting overlooked by what is now called Whitby Street but which was then known as Winston Street in honour of Winston Churchill. In July 1914 King George V, Queen Mary and their entourage disembarked here for a royal visit to Beardmore's Parkhead Works. The station was a victim of Beeching's rail reform and closed in the late 1960's. In 1969 it was filled in and landscaped.